An email address is required in order to download this file. 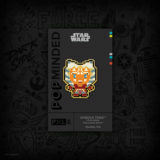 The fan favorite Jedi apprentice from Star Wars: The Clone Wars continues PopMinded’s line of PXL8® collectible enamel pins. Styled as an 8-bit rendition, 100 pins will be available each day for $8 each.